An interesting pedal, but one that’s not without the odd flaw. Difficult to get subtle effects. 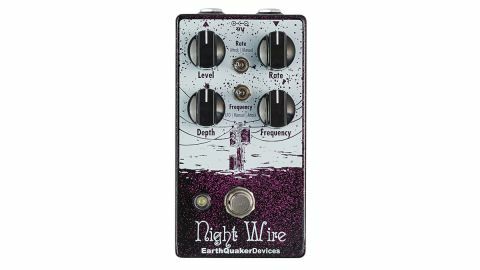 In terms of a balance between versatility and weirdness, the Night Wire delivers. With a combination of filters and tremolo on offer, it’s nevertheless the tremolo rather than phaser-like sounds that stand out. It would be nice if the rate could be set slower, as it’s hard to get more subtle phase effects, but that’s a minor gripe. Set to respond to pick attack, the trem allows for both subtle and dynamic effects, while the filter feels most intuitive in the LFO mode. Used carefully by adjusting its two modes, however, both auto-wah and uni-vibe style effects can be dialled in, even if it is a bit unintuitive at first.